on my recent travels i've been entranced by the stitch samplers i've been coming across. there's something about these unplanned, unstructured, organic pieces that utterly floats my boat. 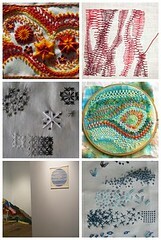 particularly when they're so deliciously embroidery-hoop-circular, like these at embroidery overlaps. many of them have been produced as part of TAST (take a stitch tuesday: flickr: blog). i've been subscribing to inaminuteago for months as a general textile arts resource, without any plan to take the embroidery side of things further. but as we all know what i really need right now is another new category :D so i might just have to give it a go.